I grew up on the Jersey shore and have always had a passion for the lapstrake sea skiffs built there, their builders and the history (have given some talks on the subject. Well,.......... I guess my passion got the best of me and three years ago I adopted a 1957, 33 ft Hubert Johnson Jersey sea skiff. 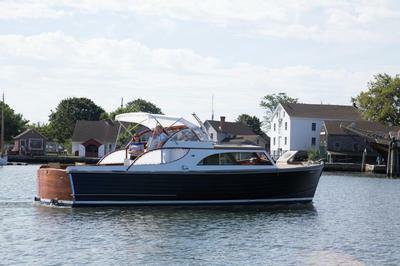 She is a classic example of a mid century lapstrake, Jersey white cedar on steam bent oak rib, copper riveted, sea skiff. She even has her original flat head six cylinder Chrysler Crown engines! 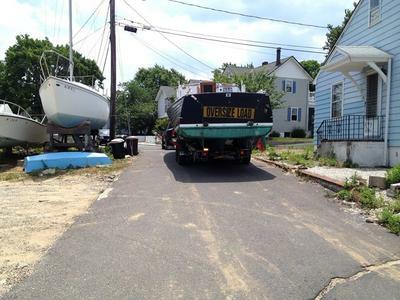 The only issue is that she was walked away from and abandon in a boatyard in 2000, and this was 2014. The engines hadn’t even turned over in that 14 years. Oh,.... and I live 200 miles from where the boat was. Remove the entire stem, scarf on a new top 24” and reinstall it. 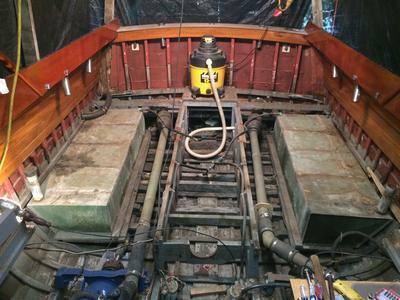 Carefully disassemble and remove the entire foredeck replace the deck beams with new white oak, lay a 1/4” marine ply subdeck, then replace the original teak ( in TDS fitting epoxy). Rebuild/ replace the cabin windshield. 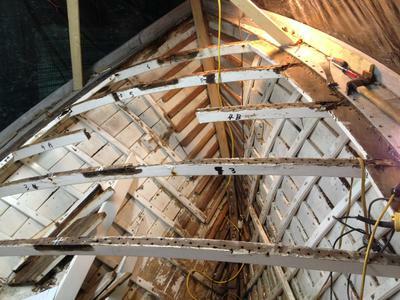 Replace the enture main builkhead between the trunk cabin and the wheelhouse. Rebuild/replace the aft 3 ft of trunk cabin. Disassemble the teak cockpit sole, remove the fuel tanks, re-rib the turn of the bilge in the aft 1/3 of the boat, install new white oak deck beams, relay the original teak and give it a proper caulking. Removed most of the interior, stripped the paint, repainted the parts and reinstalled it. A little engine work and cleanup. Three years and two weeks after coming home she was tossed in the water.